A call to Bruce Schattenburg at The Sacks Group Yachting Professionals reveals that the planned auction of Broward's 36.88m superyacht Java last Sunday didn't take place after all. And it's for the best possible reason, as Bruce tells me that a couple of serious expressions of interest were made prior to the auction and the superyacht is now under offer. 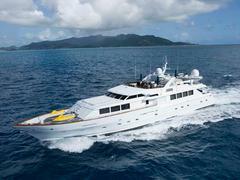 "If the deal completes as planned, Java will continue to serve as a successful charter yacht," says Bruce. Built in 1990 and refitted in 2003, Java has an excellent charter record, accommodating 10 guests in a master, two doubles and two twins and was asking $3.9 million.